"We are families. We are people of faith. We are part of this community. Pass immigration reform that honors these American values." 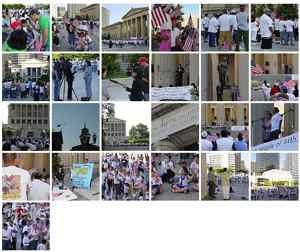 The Tennessean reports here that 500 people gathered at the immigrant compassion prayer vigil yesterday at War Memorial Plaza in downtown Nashville. Pastors, children, musicians, and at least one politician (Rep. Rob Briley) took the microphone in a plea for Godly values to infuse the immigration bureaucracy reform process and for politicans to integrate their religious values with their political power. At the front of the gathering, children held up a banner that read, "We are families. We are people of faith. We are part of this community. Pass immigration reform that honors these American values." "'I'm here because I first want to pray that God moves the hearts of all the congressmen in this country,' said Maria Vazquez of Hermitage, who brought her four sons to the prayer vigil." "Several Hispanic pastors led the audience in songs and prayer. 'Today I'm not here for people to listen to me,' said Freddy Valcarcel, pastor of Lighthouse Baptist Church in Clarksville. 'Today I'm here to pray for people to listen to God's mandate.'" "'A couple of years ago, we entered into a covenant with a Hispanic United Methodist Church,' the Rev. James Cole of the Woodbine United Methodist Church on Nolensville Road, told the audience. 'We wanted to start from the basis that we are called to live as God lives and loves.'" "'Love one another with mutual affection. Extend hospitality to the strangers.'" "The Rev. Ann Van Dervoort, associate priest of the St. Paul's Episcopal Church in Franklin, 'In February, I was challenged to be a prophetic force, to preach love when the topic of immigration was hot and misunderstood.'" "'We are all called to be prophetic if we dare. 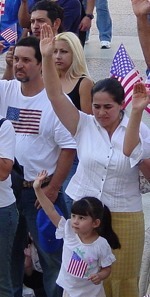 It was immigrants who were keeping our church so very clean, and it was immigrants who were keeping our children. For me, if I just changed a few hearts and minds, it was important.'" As they did last year in a downtown march of much greater numbers, the people who attended this vigil wore mostly white shirts in a gesture of peace. Unlike last year, however, this year's gathering displayed only American flags, likely due to public backlash and misinterpretation of various home country flags flown in last year's rallies.